Ok, just so my five readers don't think I am just a comics-reading philistine, here is a selection of some of the fiction I read this year. I'm reading The Savage Detectives right now, so that should count as a 2008 book. (It's really good, too!) Even less that the comics, almost none of this stuff was published this year. I think the Bud Shrake was, but nothing else. I'm too lazy to check. I bought these books at Kaboom (one of the few positive things about Katrina is that it brought Kaboom here--positive for Houston, negative for New Orleans), Half-Price Boooks, the Brazos Bookstore, and Powells.com. 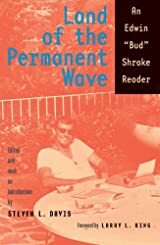 Land of the Permanent Wave by Edwin "Bud" Shrake. Excellent. Shrake is an uneven writer, but this collection is generally pretty good, and even when it's not great, it's at least entertaining. Makes me want to pick up some of his novels that I haven't read. 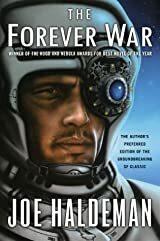 The Forever War by Joe Haldeman. This 70s book feels very dated--there's nothing that ages more quickly than science fiction, ironically. However, despite the fact it was written in response to the Vietnam War, it is relevant--especially the notion of a war begun under false premises that ends up lasting far longer than anyone ever anticipated. Familiar? You bet. Kalpa Imperial: The Greatest Empire that Never Was by Angelica Gorodischer. Quite good. 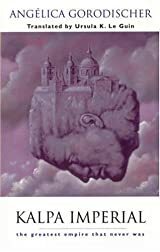 Recalls in some ways Calvino, Borges, Nabokov, and even the Doris Lessing of Shikasta. A Soldier of the Great War by Mark Helprin. Quite an enjoyble piece of Marquez-like richness. Veering between a certain lyrical realism, to comic (yet sometimes beautiful) absurdity--the Austrian Hussars lead by a committed pacifist who invents battles, the scribe in the War Ministry who regularly, randomly changes orders... A massive and moving book. Drama City by George Pelacanos. Rather unlike his other novels, and very much like The Wire. You could easily see this story unfolding in two or three episodes of The Wire. Indeed, I wonder if he may be recycling discarded Wire ideas. Lorenzo could be a first draft for Cutty, for example. And the NA/AA meetings feel very much like those in the 5th season of The Wire. Not that I'm complaining. It's fertile ground and perfect for Pelecanos. 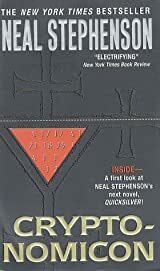 Cryptonomicon by Neal Stephenson. This maximalist novel is like the trainwreck of Gravity's Rainbow with Foucault's Pendulum. 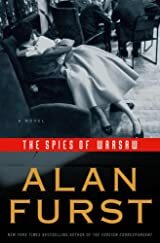 Two threads of story, one in WWII and one in the 90s move snakily and simultaneously through the novel, converging at the end like future and spot prices. There are lots of good bits here, where Stephenson shows off his huge knowlege and verbal tricks. But the parts are greater than the whole, unfortunately. Entertaining, but ultimately a bit disappointing. Flashman by by George McDonald Frasier. Quite humorous, and a corrective to the notion of "heroism". There are heroes in this book, but they usually end up dead. Flashman survives solely on the basis of a strong desire for self-preservation, and sheer luck. But he is quite willing to take credit for heroism--especially if he is the sole-survivor of a prticular fracas. This "memoir" corrects these stories. Shikasta: Re, Colonised Planet 5 (George Sherban Emissary). An unusual novel, made up a collection of reports, communiques, and observations. Similar to First and Last Man, which clearly influenced it, in its historic scope, but as the novel goes on, it becomes more and more novelistic. The basic idea is that the entirety of human history past a certain point has been a negative reaction to the malign influence of Shammat, a planet of outlaws that somehow feeds off the negative feelings of Shikasta (Earth). In the meantime, an inexplicable cosmic catastrophe has deprived Shikasta of SOWF, which is a kind of cosmic good vibes beamed from the empire of Canopus. Lessing mixes in the Old Testament, radical politics, contemporary (70s) terrorism, psychology, feminism and mysticism in this wild concoction. These are themes she returns to again and again, so it is not so surprising to read them here. At first, this novel seemed like it would be tedious and didactic, but it turns out to be quite moving. But like Stapledon in Last and First Men, she is pretty bad at predicting political developments--in her case, she saw a general decline of Europe and a rise in the power of radical left movements there, culminating in political dominance by Red China and a nuclear war. She did hint at the rising power of Islam as a political force, though. Memoir from Antproof Case by Mark Helprin. A maximalist fiction, and as such, it has sumilarities with others of its class like One Hundred Years of Solitude, Gravity's Rainbow, and Life: A User's Manual. Tender, exciting, absurd. Very enjoyable. The great gold-robbery chapter alone would be a magnificent novel, and it is only a fraction of the whole. CivilWarLand in Bad Decline by George Saunders. Boy is this one grim book. Funny in spots, but the seething undercurrent of hopelessness tends to blot the humor out. He has a definite beef with modern management lingo and thought, with its vision statements and whatnot. The best story is "Bounty" (also the longest story); it is set in an America that has collapsed due to polution and new diseases, separating normal people from mutants (called "Flaweds"), who can, in the Western half of the country, be legally enslaved by Normals. This newly pastoral, medieval America still has these bizarre corporate euphemisms for almost everything. And I have to admit, that is very funny.